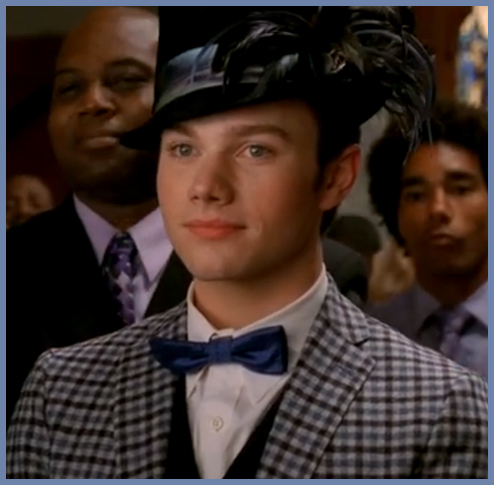 I’ve been meaning to do a post on hats for a long time now, and after watching Glee last week and seeing Kurt’s fabulous church hat, I decided I had to pull it together and make this post happen—so thanks for the inspiration Kurt! I’ve always admired people who can really pull off an amazing hat. I’ve tried before but I always end up feeling awkward and obstructed somehow. Winter hats are a different story, they’re much-needed and practical, what I’m talking about are statement hats, they draw attention, they express an attitude, and they require a special kind of confidence to pull off. 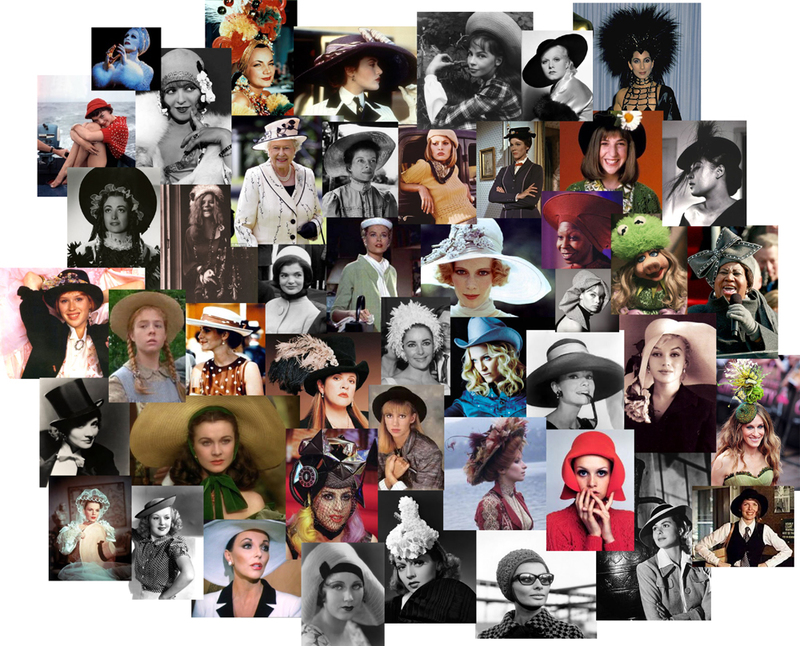 I put together this collage of fabulous hats worn by fabulous women as inspiration for myself, and maybe for all of you too. Nothing shows off your confidence like an amazing hat. I consider this to be the ultimate fabulous hat, so it gets its own picture. 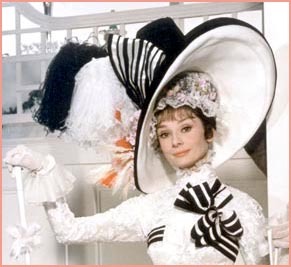 If you haven’t seen the film My Fair Lady, it’s worth it just for Cecil Beaton’s costumes and this hat. One of the reasons I wanted to do this post is because at my wedding in 17 days (Ahhh!!) I will be wearing a hat. 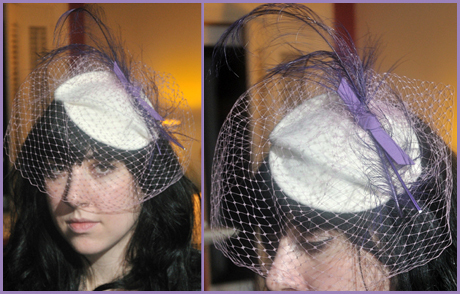 I kind of love the idea of a “wedding hat”, it seems so old-fashioned somehow. I had it made at a great little hat shop on Thompson street in the village, they did the purple bow, feathers, and lavender veil custom for me, which I love! Since most bridal salons charge upwards of $200 for a row of Swarovski crystals pinned to a piece of tulle, having a custom wedding hat made doesn’t seem extravagant—it seems like a lot more bang for your buck. 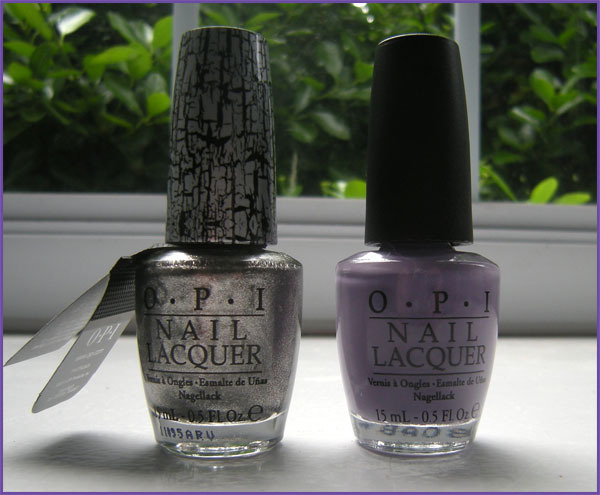 I can’t wait to wear it—it goes perfect with my purple shoes! Wedding hats—and any statement hat, are a great way to add some pizazz to an outfit, and unlike other fashion risks, you can always just take the hat off if you decide you don’t like it. Anyone have pictures of themselves in fabulous hats? I’d love to see them! *Sorry my posting has been so sporadic, this whole wedding thing takes up a lot of time. 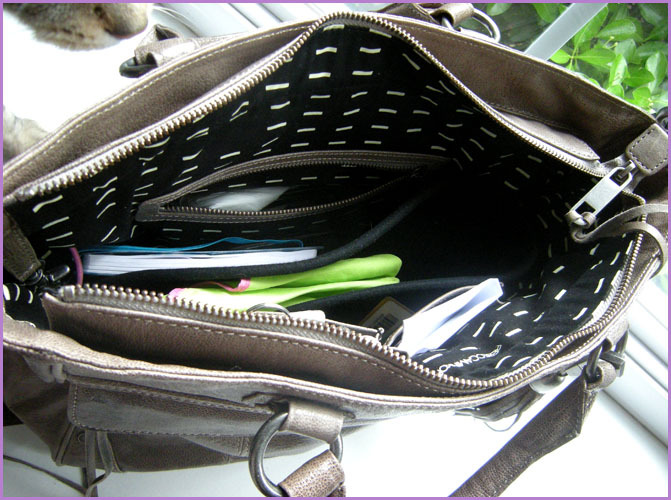 I’m taking a break from well thought out posting today because I am overwhelmed with a long list of things to do which I keep putting off since I like writing this blog so much more than doing important stuff. I need to take care of some of those important things today so instead I am bringing you a potpourri of silly things, you can probably expect more posts like this as my wedding approaches and I start to panic. 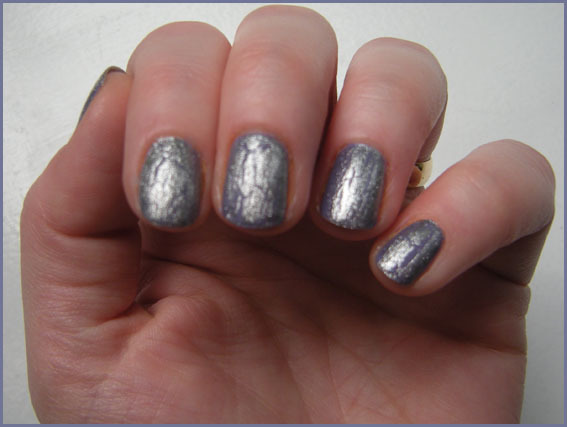 Here’s a picture of a pretty new Orly nail polish I bought last week, it’s a mini bottle called it’s up to blue and was only $2.50 at CVS, it reminds me of mermaids, and I’ve been loving metallics recently, so I love it. Here’s a funny video of the most amazing cat on the internet, if you haven’t seen him before check it out, his name is Winston and his owner is Rich, who writes a funny blog, and I’ve never seen another cat like him. I recommend watching it until the end if you think cats are funny. Here is a pretty picture of chrysanthemums, it’s wedding inspiration for me. I’ll leave you with a polyvore collage of cute stuff from modcloth, just for fun. I hope to see you back here tomorrow for Beauty in the Movies, this week we feature one of my favorites—Volver. 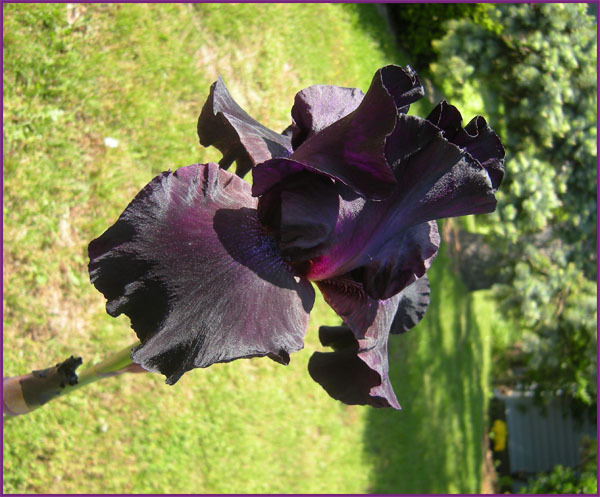 It gets better every time you see it, so don’t forget to check back here to read more about it! This is going to be the first of many jewelry posts, I can’t believe it has taken me this long to post on one of my favorite topics. I’m sort of an accessory, particularly jewelry, junkie. I rarely even think about it, but I have five pieces of jewelry that never leave my body including when I sleep. The ring I wear on my right hand I bought for myself on Cumberland Island, a little island off the coast of Georgia where one of my closest friends and her family have houses. Her cousin Go Go is an amazing jewelry designer, and I love to wear my rattlesnake rib ring because it’s beautiful and organic and it reminds me of the great times I’ve spent on Cumberland with my friends, so it makes me happy whenever I look at it. This bracelet hasn’t left my wrist since my fiancé got it for me at C’est Magnifique in April. It is one of the most interesting jewelry stores in New York, if you want something different go check it out. It has been there forever, I used to go with my mom when I was a kid. The original owner was sadly murdered, and now it is run by his nephew who is incredibly nice. He believes certain pieces should be with certain people, and while that might seem strange for some, I think it’s kind of great. If he doesn’t think it’s right for you and that you’ll appreciate it, he doesn’t want you to walk out of there with it. 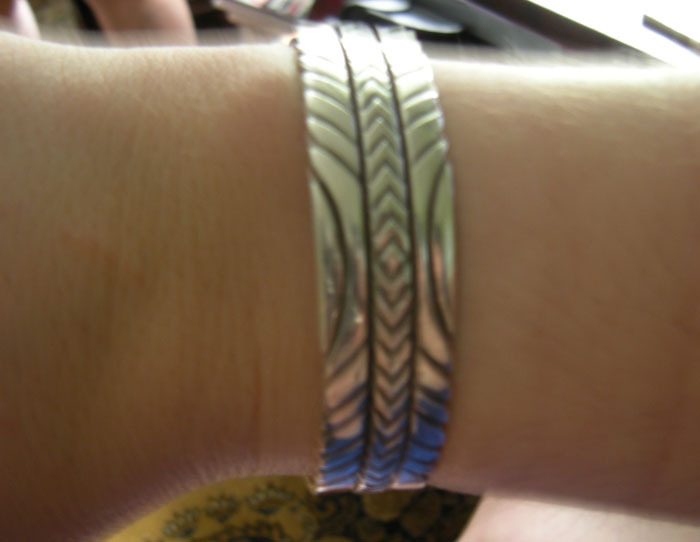 I fell in love with this southwestern silver bracelet instantly, and he gave it to us for a great price! This necklace was given to me by my sister, it’s from etsy, and it’s a sloth. She and my mom like to tease me that the sloth is my spirit guide since sleeping is still one of my favorite activities. 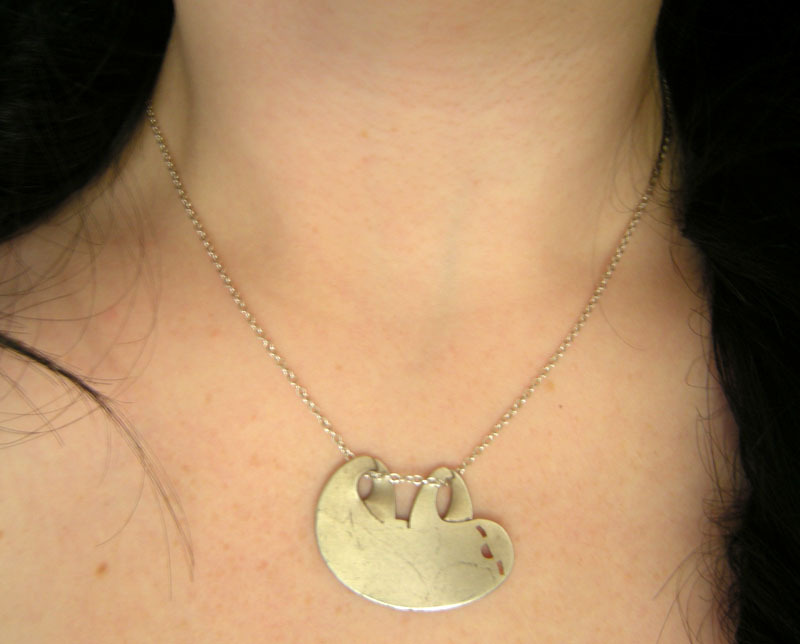 It’s very comfy to wear and although I love necklaces and change them often, I wear this one as my stand-by and then switch it off for others when I feel like it. 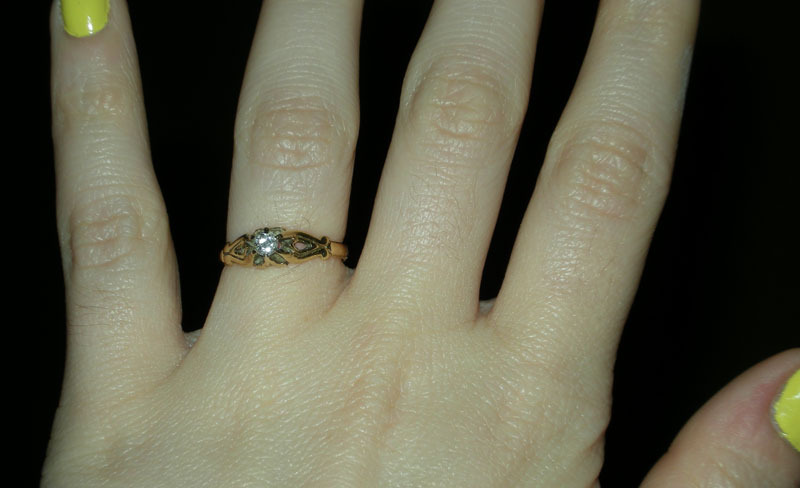 Obviously the most symbolic thing I wear is my engagement ring on my left hand, which was my mother’s (she wears her mother’s ring now) and my father had it custom made for her. I like that it isn’t a huge rock, it makes it more comfortable to wear, and I love the setting. Plus the jeweler who made it for my dad engraved his initials JP on the inside, and I’m Justine Patrice, what a happy coincidence! 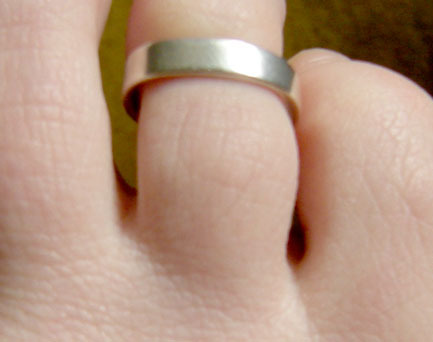 Though I’ve been made fun of for it, I also wear a toe ring, I just like it, not sure why. This picture is kind of gross, eww feet—sorry! 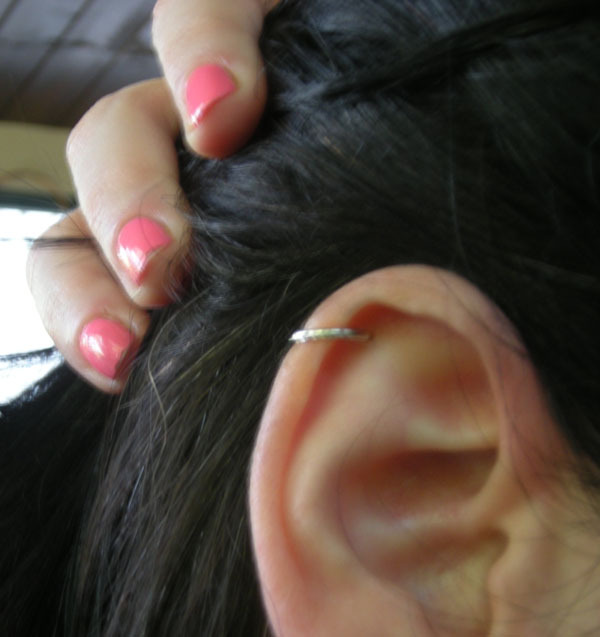 Oh wait, I have an earring in my cartilage too, I’ve had it since high school and always forget it’s there. It’s interesting that most of us, including men, wear some form of jewelry on our bodies most of the time, more than any other piece of clothing or beauty product, these accessories sometimes have deep meaning to us. A lot of people wear engagement and wedding rings everyday as a reminder of the relationship that they’re committed to and a symbol that links them back to another person, but any piece of jewelry from someone you love can act as a reminder of them. 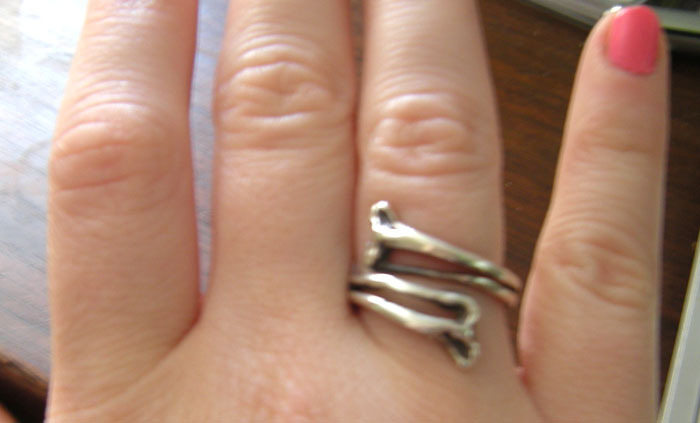 Sometimes the meaning that jewelry carries can be painful too, like when it’s from an ex. Crosses, stars of David, Udjats, jade coins, every culture has at least one if not many talismans or amulets that are worn as jewelry and meant to protect against evil or act as a sign of good luck. The human connection to jewelry is ancient, the oldest piece of jewelry is 100,00 years old and comes in the form of beads made from seashells. In many societies jewelry signifies wealth, and it is still one of the best investments you can make. If you buy a beautiful piece of jewelry, it will retain its value far longer than other items you may invest in. There really is no limit to where you can adorn your body with jewels, but it seems that many people have a favorite. Some love earrings and would choose a pair of gorgeous white gold hoops over a strand of pearls any day. There are women (and men too) who just don’t feel right leaving the house without a ring on their fingers, or a bracelet on their wrist, or a locket around their necks, it’s a very personal thing. My sister favors big dangling earrings, while my mother wears a wrist full of bangles that jangle when she walks, and I personally love long necklaces and post earrings (which are also a favorite of my grandmother). Some jewelry just feels right when you wear it, and it should. Jewelry can make you feel beautiful, it can make you feel connected to someone, and it can even make you feel safe. I still have a bracelet that my mother used to put on me or my sister when one of us was having a nightmare, she called it the “dream bracelet”, and honestly, when I put it on, I felt safer, it really was magic. When I first meet someone one of the first things I notice is their jewelry, whether it’s a pinky ring on a man, or a pin on a woman’s coat, I always feel it says so much about them. 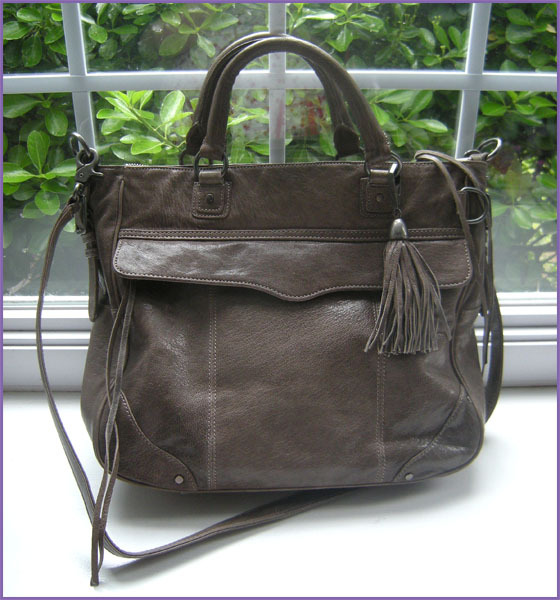 When you compliment someone on a bag or a scarf, sometimes they might say “oh, it was my mother’s”, but usually it’s just an accessory. With jewelry, so often when you compliment it, or ask about it, there is a story that a person can tell you about it, even if it’s just to say that it came from a cool flea market, but sometimes you get some really great stories. I have a watch necklace that was given to my great-grandmother Rose by a boy who proposed to her when she was young, unfortunately her parents wouldn’t let her marry him. He engraved her initials onto the back of the watch himself, and it always makes me so sad for him when I wear it, but I love that there is a story behind it, and I love that my grandmother always kept it. 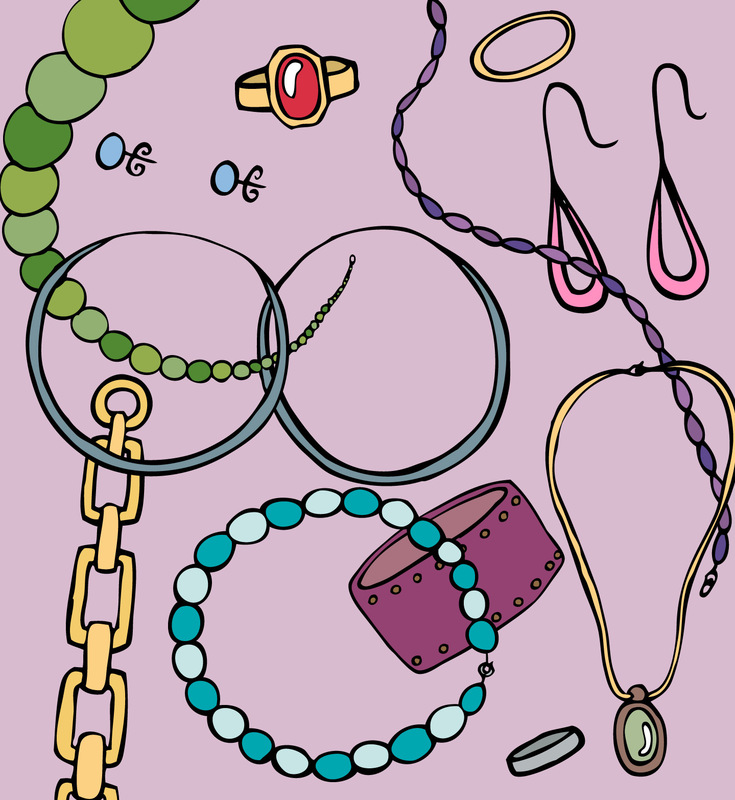 Whether it was a friendship bracelet given to you in summer camp, or a family heirloom passed down for generations, I think all of us have been touched by jewelry at some point, and that’s something you can’t say for many other accessories or beauty products. What about all of you? Do you have pieces that never leave your body? Do you wear a different “statement piece” everyday? What does the jewelry you wear remind you of or make you feel?